Linville Falls, at the head of the Linville Gorge, sits in a recreation area managed by the National Park Service with the Blue Ridge Parkway. 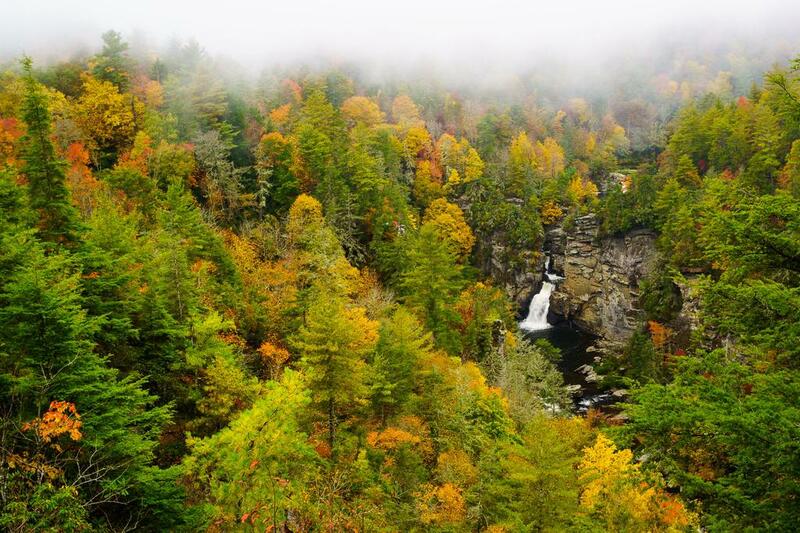 Linville Falls as seen from Erwin's View in fall color. 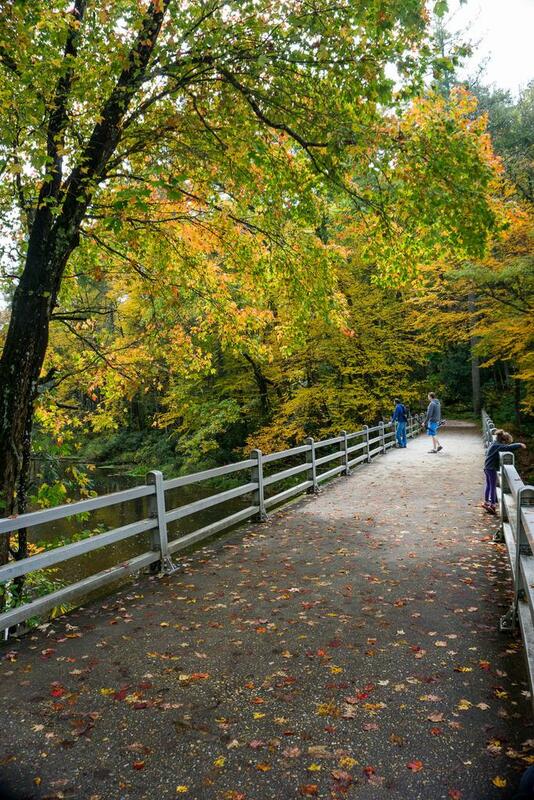 Bridge over the Linville River on the Linville Falls trail in fall color. Linville is one of the most-visited, most-photographed, and most storied falls in the entire Blue Ridge region. The falls' spectacular scenery, combined with easy accessibility yet wilderness-like setting at the tip of Linville Gorge combine to make them unparalleled. A small yet complete network of trails leads to Linville Falls and surrounding viewpoints. Starting at the visitor center, the Erwin's View trail leads to an overlook of the same name, passing the Upper Falls and Chimney View overlooks along the way. It's mostly a ridge-top trail, moderate in difficulty. The Plunge Basin trail leads from the visitor center to the base of Linville Falls at its plunge pool at the very top of Linville Gorge, passing another overlook along the way. This trail is also moderate in difficulty, but is a bit rougher hike than Erwin's View. The Dugger's Creek trail is a very short loop connecting to both ends of the parking area. It passes Duggers Creek Falls, a neat little slot-canyon waterfall located surprisingly close to the parking area (just out of sight from the road). Adding Dugger's Creek to any hike at Linville Falls is highly recommended! For complete trail details, see the Linville Falls Trails page. No official trail connects to the Forest Service trail system deeper in Linville Gorge. For details on the gorge trails, see the Linville Gorge trailhead. The view of Linville Falls from the end of the Plunge Basin trail. 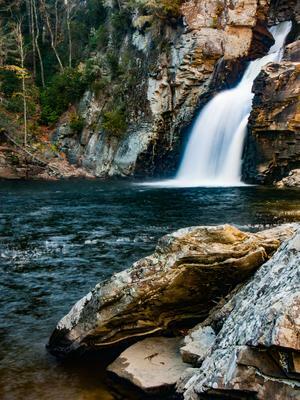 The Linville Falls Picnic Area is located across the Parkway from the waterfall and campground access road. It is a large, level area with dozens of shady sites including tables and grills, and plenty of parking. It's right next to the river so you can enjoy the relaxing sound of the gently-flowing stream while you eat. Bring some sandwiches or throw some burgers on the grill and fuel up before or after your hike! There are two loops within the picnic area (yes, it's a big one). The first loop provides a few tables in open areas where you might be able to find some sun on sunny days, but most are situated in shady woods sites. Restrooms are available in the first loop. The second loop is also to the left from the main road and is a bit more open and sunny. There are some appealing riverside sites here, and it's a bit more open. The end of the road forms anotherloop and there's some tables in the fields around the loop as well as in the woods. There's a large covered picnic shelter with half a dozen tables for those rainy days. It's available on a first-come basis. At the end of the spur road is the Linville Falls Visitor Center, which shares the parking area with the trailhead. It offers flush restrooms and a small store, with maps and educational exhibits about the falls and surrounding geology of the area. The Linville Falls Campground is along the road to the falls visitor center. It offers 64 sites, flush toilets, tables, grills, and and campfire rings at each site. Many are in open areas and the rest are shady, wooded sites. It's within walking distance to the falls and a short drive from many other attractions along the Blue Ridge Parkway and surrounding region. 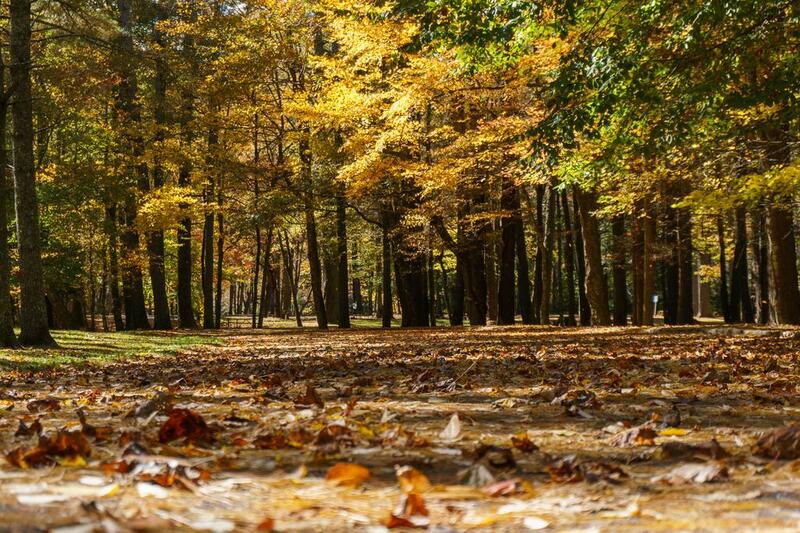 The campground is closed in winter (November - late May). For more information or to reserve a site, visit the Linville Falls Campground on recreation.gov.